Forty-eight states currently have budget shortfalls. The common strategy being dictated in many of these states and in Washington is to call for budget cuts, eliminating important safety nets for the middle-class and those below the poverty line, as well as to repeal legislation guaranteeing collective bargain rights for unions. 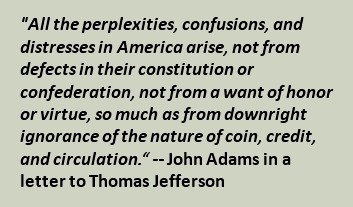 It’s as if the states and the federal government were corporations with no responsibility to their real stockholders, the citizens of the U.S. 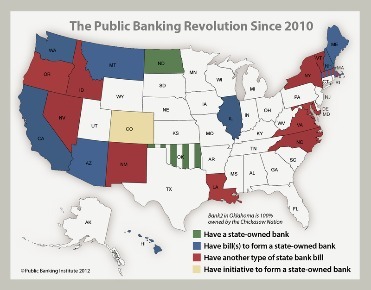 However, 20 states have decided enough is enough; they have introduced legislation for publicly owned banks or derivations, or for studies or task forces to determine how a publicly owned bank would operate in their jurisdiction. Three of these states have bills that were submitted in 2012 -- thirteen states had bills submitted in 2011. Colorado has an innovative initiative. • Status: No legislation submitted. 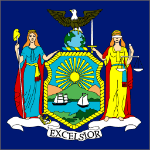 by the state of New York or an authority constituted by the state of New York and report within 2 years. • A06737 Actions: 03/28/2011 referred to banks, There are no votes for this bill in this legislative session. More state bill information here. Want to be a PBI State Coordinator? If your state is not listed, let us know and we'll help you start educating your community! • Take Action: List of things you can do. • Status: HJ62 Bill Introduced to VA General Assembly to Study Whether to Establish a State Bank. Tabled. • Text of Legislation: House Bill. Senate Bill.